The official two-day visit of China's President Xi Jinping to France holds a substantial economic content with the Belt and Road initiative at the centre of talks. President Macron invited Germany and the European Union to join talks with Xi for the final stage of his European tour. China's President Xi Jinping is to be officially welcomed by President Emmanuel Macron under the Arc de Triomphe at 14h30 GMT today followed by a meeting at the Elysees Palace. The two heads of state and their respective spouses already met in Monaco and had dinner on Sunday evening at the small seaside town of Beaulieu-sur-Mer on the French Riviera. 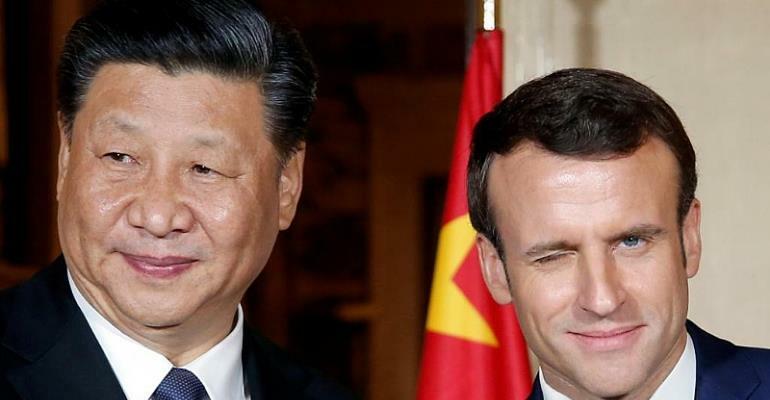 Emmanuel Macron tweeted that this visit of Xi Jinping to France will help to enable a strong multilateralism involving France, Europe and China. A series of cooperation deals on nuclear power, aerospace and clean energy initiatives, some involving lucrative contracts, are expected to be signed on Monday afternoon. Including a reported order of 180 Airbus planes. In a letter published in Le Figaro daily, Xi called for more trade and investment between the two countries. Macron said Europe needs a joint approach to China rather than acting as individual countries. Comments aimed at Italy which signed up 29 deals under China's Belt and Road Initiative (BRI). The BRI involves major infrastructure project linking Asia to Europe, similar to the ancient Silk Road trade route linking China to Europe. Speaking at an European Union summit on Friday, President Macron called for Europe to wake up regarding the bloc's trade relations with Beijing. “We put ourselves in a situation where Chinese investments have taken over strategic infrastructure assets. I think it was a strategic mistake,” said Macron. In a bid to unify the EU's position on China, Macron invited German Chancellor Angela Merkel and European Union Commission president Jean-Claude Juncker to join President Xi and himself in Paris on Tuesday. Talks aimed to explore "points of convergence" ahead of an EU-China summit in Brussels next month.